1962: Replacing the RT family. After the carefully planned and executed trolleybus conversion there was something of a hiatus. 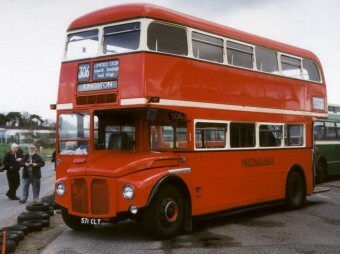 RMs were still coming off the production lines, but there was a dispute between management and unions over the conditions for RT family replacement: the management wanted to replace ten 56-seater RTs with nine 64-seater RMs, thereby easing the staff shortage, while the unions saw this as a service worsening and the wrong way to tackle the lack of staff. So during the autumn of 1962 new RMs accumulated in store, while the RMCs went into service with GreenLine. A unilateral decision to impose RMs at Edgware (EW) and Harrow Weald (HD) led to a short strike. The management gave in, and announced a one-for-one replacement policy. But EW never did get RMs, and HD had to wait another sixteen years! Instead LT announced a programme to convert some of its heavy duty trunk routes, replacing mainly RTLs. Hounslow (AV) was the first garage to get RMs for route 73, at the beginning of December '62, but they were six second-hand buses from elsewhere. (AV was already familiar with RMs from the trolleybus conversions). Tottenham (AR) and Mortlake (M) received new RMs, mainly Leylands, a week later. N90 from AR was consequently converted too. 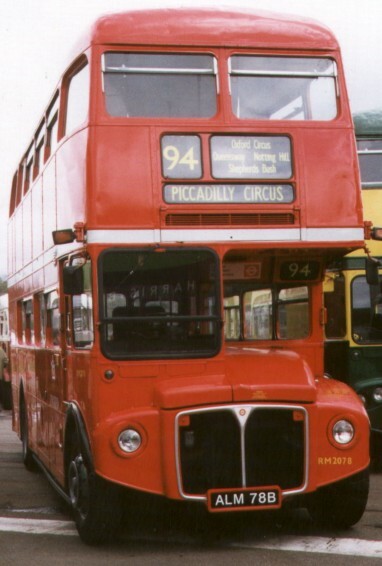 Route 37 was converted at the same time, involving Stockwell (SW) and Putney (AF), the former getting Leyland RMs. RM1266 went new to Mortlake for route 73. 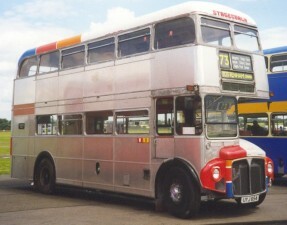 After a long working career with LT and with Stagecoach in Scotland, RM1226 is undergoing a complete strip and repaint. It is seen here at North Weald Rally in June 1998, once again wearing 73 blinds. Route 13, operated by Hendon (AE) and Rye Lane (RL) was converted in mid-December, with the RMs used on other routes at weekends. This time it was RTs that were displaced, these allocations moving around the fleet to enable the withdrawal of some of the roofbox RTs. Correspondingly, the new RMs were AEC engined. 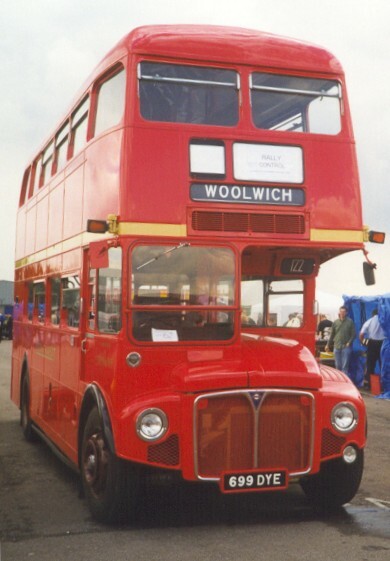 Route 16 was partly converted at Christmas, with the remainder arriving at Cricklewood at the start of January 1963. The RMs had a mix of engines, mostly Leyland but a few AEC. The winter of 1963 was one of those that was talked about for decades afterwards, with heavy snow in the London area that persisted for weeks. (I earned a lot of extra pocket-money by doing extra paper-rounds in the snow) The RMs suffered, and became the first London buses to require anti-freeze. (Perhaps those radiator blinds on the RT family had a function after all: some RMs were seen with old destination blinds stuffed between the grille and radiator. But still the cold took its toll. Several new RMs had to be diverted from the conversion programme to fill gaps in the existing allocations. During January and February a start was made on converting the 36 group. This brought RMs to the other old tram-route to Grove Park in the south-eastern edges of London, on what had been the 69 route until 1959, and then renumbered 36B. Rye Lane (RL) received a large batch of Leyland RMs for the 36A and 36B, with a gradual changeover as buses became available. RM1414 went on holiday to Manchester for a short stay. The 36 conversion followed on, during February and March, this time at Peckham garage (PM). By now the RMs had a stainless steel grille surround. The long cross-City route 9 became RM-operated during April - June, with Mortlake losing the last of its RTLs and becoming totally RM, and Dalston also receiving RMs for its share. It was not a conversion, but Uxbridge garage also received RMs, re-allocated from Hanwell on route 207. The 81B to Heathrow Airport needed bigger buses, so received RMs in June. 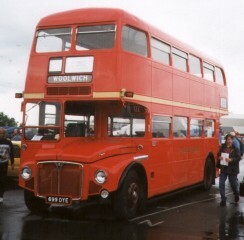 As Hounslow already had AEC RMs it was given the minority AECs from Cricklewood and Rye Lane, which received new Leyland RMs off the production line. is still working, in Surrey with Nostalgiabus. (Cobham Open Day 1998). Route 43, once a key LT route was also converted in June and July, from Muswell Hill garage, giving rise to a plethora of Sunday RM routes there. Highgate already had some RMs operating on the 63 route, but the rest of the allocation, from Peckham, was converted from RTs during the summer months. The 85/A were changed over using RMs from the withdrawn 276 route (from Highgate). Putney received a load of AECs from W and borrowed some Leylands from M, for an overnight changeover of the 14, the first major loss of RTWs. (Most of them became trainers: their 8ft width made them good practice for budding RM drivers.) The borrowings were made good by further deliveries of new RMs, Leylands to W and then some of the new AECs to AF. Route 14's conversion was completed by changing Holloway's allocation for Leyland RMs too. New grilles with badges appeared from RM 1682 onwards. By now the RMs coming off the production lines looked much like RM 1699 does in preservation. (North Weald, 1998). It has been nicely restored to original condition, with the brake ventilator grilles re-instated, along with the full depth heater intake grille, and the offside route indicator window. It correctly has a badge grille. The livery too has the cream band and traditional London Transport fleetname. Route 24 was converted during November 1963 using new batches of AEC RMs allocated to Chalk Farm (CF), most of which - from RM 1742 onwards - now lacked offside route indicator boxes. The order had gone out and very soon the earlier buses too had these windows blanked, overpainted or re-panelled. This was another RTW replacement. 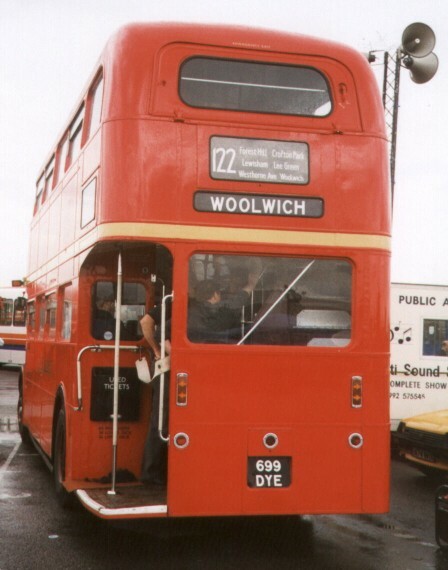 West Ham and Walthamstow had received RMs for the 41 and 123 when the 41 was diverted during the trolleybus replacements. Now Tottenham was to lose the RTWs that it used on these routes, receiving a mixture of new AECs and new Leylands for the job. Mid-production RM: badge grille and no offside route box. Barking received RMs to run alongside Poplar's contingent on the 23. Alperton's RTs on the 18 gave way to RMs, to match those from Stonebridge and Middle Row. The 15 and 100 routes were unusual for the Central Area in that they interworked. Although this was commonplace in the Country Area it was rare indeed for red buses. Route 100 operated irregularly, using buses from the 15 as required. This practice, used with Guys and RTWs, was continued with the RMs. It was useful, and avoided another Union wrangle, no doubt, that the offside route boxes had been abandoned! From RM 1902 onwards there were no brake ventilator grilles. From the beginning of June RTLs on route 30 were replaced at Putney by RMs, some of which had illuminated offside advert panels (plus a small one in the saloon). These included the pioneer, RM 1577. Hackney's contingent followed on in July, all illuminated ad buses. The 134 group was converted in the second half of July at Muswell Hill, Holloway and Potters Bar. 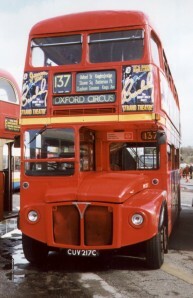 Croydon was next to convert from RTs to RMs on the busy 130 group. I expect you can guess. Yes, it was secondhand RMs. A handful of new ones had been allocated in May, before the illuminated ad buses began to appear. But the new buses in the autumn all had the ads, which were not to be wasted on the denizens of New Addington. So those went instead to Dalston and Hendon for their cross-City routes, while their cast-offs went to Croydon. Victoria garage DID receive illuminated ad buses, however, for the 137. So did Norwood and Chalk Farm, for route 3, converted at the tailend of 1964. RM 2078 was new to Norwood in late 1964. 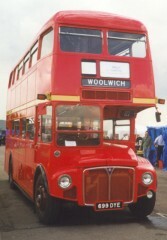 It now operates for London United, having been resurrected from the London Transport Reserve Fleet in 1997. It is seen at Cobham Open Day, 1998. The 40 was altered at the start of the year, and reallocated to Camberwell and Poplar from Upton Park, receiving old RMs from around the fleet to replace the RTs. The 6 and 8 groups both had large allocations and involved Willesden. The number of RMs required for conversion neatly matched the remaining number of standard-length RMs on order. The changeover was quite protracted, taking place over the first half of the year, with a small number of new RMs kept in reserve, to be doled out in the autumn. By the end of production the RMs had the bottom half of the heater inlet blanked off, with the cant rail band, by now flake grey, running across. This concluded the main deliveries of new RMs, but there were a few held in reserve for one reason or another, that trickled into service later, culminating, of course with the very first, RM8, in March 1976! RM2217, the highest numbered of the "short" RMs, went into service at Willesden in September 1965. It is a frequent attender at rallies, although still a working bus with Arriva South London (BN). This appearance was at the Cobham Open Day, April 1998. Still to come were the RCLs and the hard-working RMLs, but even they would not complete the replacement of the RT family. There were still RTLs in operation, and the Saunders roofbox RTs still had several years to go, quite apart from the bulk of the RT8s. But London Transport had other plans for the future, that took the shape of high-density single-deckers, and did not appreciate the value of the RM.